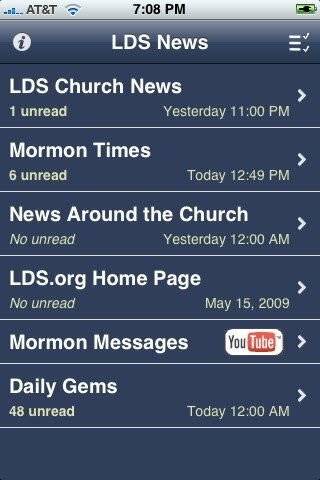 LDS News, now available in the iTunes Store for iPhone and iPod Touch. • Arrange the selected services in your preferred order. • Indicates when the most recent story or Gem was posted. • All times and dates displayed in your local time zone. • Items are cached to limit network traffic and for quicker loading of stories at launch. • Keeps track of stories you have already read and indicates how many remain unread. • Story links can be easily emailed to yourself or others. • Gems can also be emailed with the title, author, the full text of the Gem, and the link (when provided) to the talk from which the quote was taken! 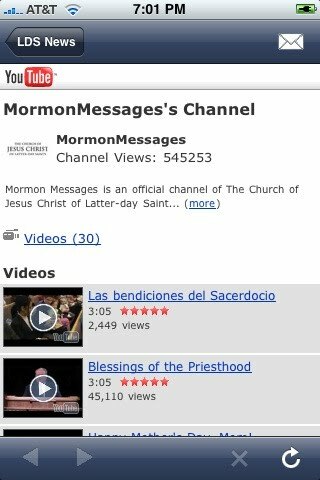 • YouTube channels allow viewing the videos directly within LDS News using the built-in iPhone/iPod viewer. Finish the video and be right back where you left off. • The YouTube channel viewing is kept within the channel so you can't accidentally leave it. • LDS.org Home Page YouTube videos are integrated right into LDS News using YouTube tools to allow embedded viewing. 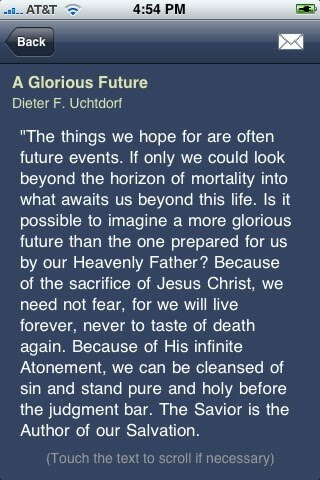 LDS News - Available in the iTunes Store. Note that this application has no affiliation with The Church of Jesus Christ of Latter-day Saints. All content is offered through public RSS feeds and is owned or provided by the respective service. The YouTube name and logo are trademarks of YouTube.com.